Art on the Side: I'm Back! I'm finally back and ready to get on with my art. I have a few excuses for not updating the blog. Mostly it's because I've been neglecting my artwork big time. Real life just seems to impose its demands at the most inconvenient times. Let's see, a few things have happened since I wrote here last, first, work got crazy. They started switching me around on odd shifts. Third shift was the worst, it messes with your body rhythms, so even when you are home and awake, you don't feel like doing a thing. I also hosted my sister's wedding reception in my back yard, went on an Alaskan cruise and then last but not least, I got my pink slip at work. Yeah I got the axe along with about a hundred other folks at the satellite factory. Or you could say that I was caught up in the RIF (reduction in force), in the downsizing,or how about, in the involuntary attrition. My personal favorite euphemism to date is, real-time market-responsive human resource shaping. Uhmm....yeah, so anyway, all this kind of explains why my mind has not been on art lately. So what now? Well now, I have more time for art! 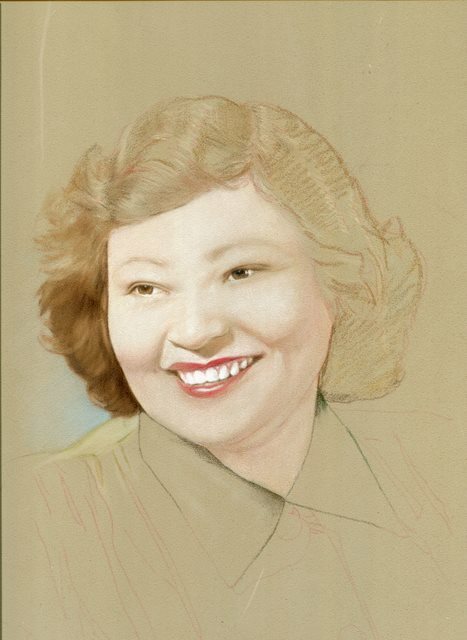 I started working on the Mom picture again. It felt great to pick up my pencils again. I have a series of new scans with a few small updates and you will notice that the color is a bit different from the previous scans. That's because I bought a new scanner! I'm very pleased with my new Epson Perfection V300 Photo Color Scanner. For the very reasonable price of $90, it does a great job of no-hassle picture scanning. I think it does a better job than our older more expensive Epson 4490 Photo Scanner. 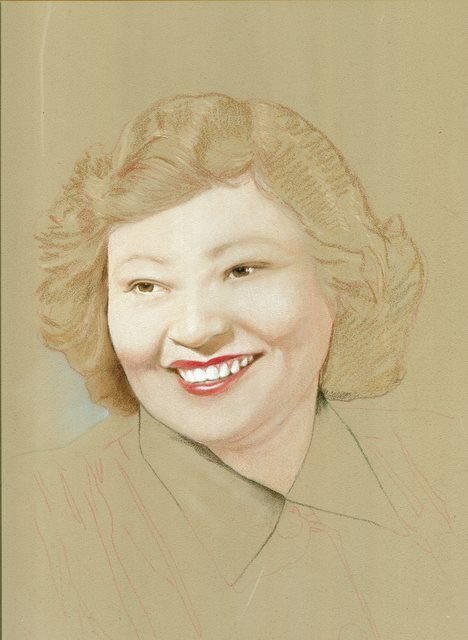 I bought it with the intention of scanning all my old family photos and I was looking for an inexpensive, reliable scanner. True to the reviews, the V300 has some great built in color correction software that make restoring great color to your old photos a snap. Now since I have my very own scanner sitting next to my own computer, it comes in very handy to make quick scans of my artwork. I was happily surprised to see that these scans were actually truer in color than the previous artwork scan, an unexpected bonus, considering that I don't need the color restoration feature for scanning artwork. I did some work on the teeth and lips and then decided to continue on with the hair. Since dark hair will surround the face, it's probably a good idea to put this in next to judge how much darker or lighter the skin tone should get. 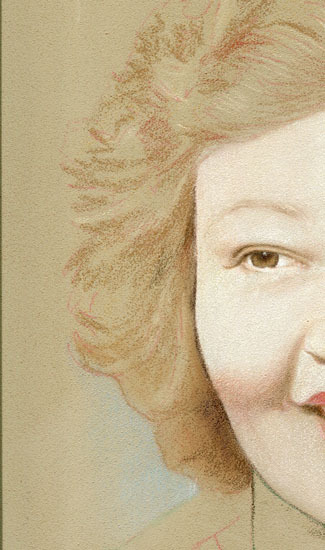 Here is a closer look at the work I did on the hair. I decided to adapt a technique I've seen used for drawing hair in digital paintings. The idea is to place your lines of lights and shadow colors and then blur them. You repeat the process time and time again, building up to your last layer which retains the sharpest lines, highlights and shadows. I lay down color, generally trying to place the areas of light and dark masses as dictated by my reference photo.Once I had some color down I used my small bristle brush to spread the color around. 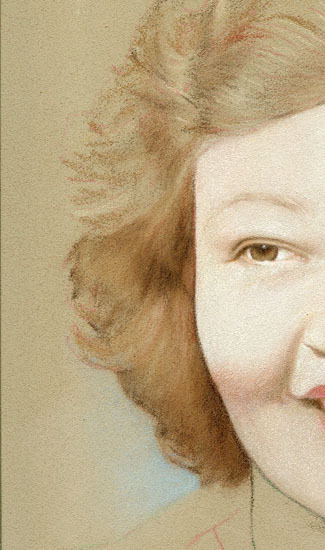 This intensifies the color and softens it at the same time, mostly removing the evidence of individual pencil strokes. With careful brushing you can retain your areas of light and dark, spreading the edges to where you want and making a good backdrop for more layers of color. Here is what it looks like after a few iterations of this process. On this step I've added strokes of color again on top of the previous layers. It's not done yet, but I imagine that the last layer will retain some stroke marks made with very sharp pencils. Hopefully, as with digital painting, this will enhance the illusion of depth. 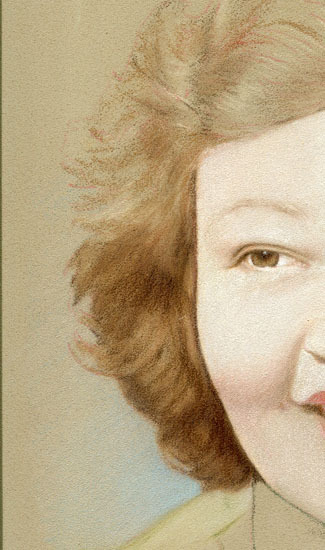 Sharper lines of color, even drawing of individual strands of hair, light and dark sitting on top of layers of indistinct masses of hair of varying detail. We shall see how this comes out.